Phew it's been a week! Between losing my glasses, dyeing like crazy, having a local event, and all the drama of having two small children, this week has been nuts! But I have 6 fresh from the dye pot colors for you, 2 of which are brand spanking new, so I hope you can find something you love to take home with you this week! Please be aware that orders from this update will not ship until Tuesday. 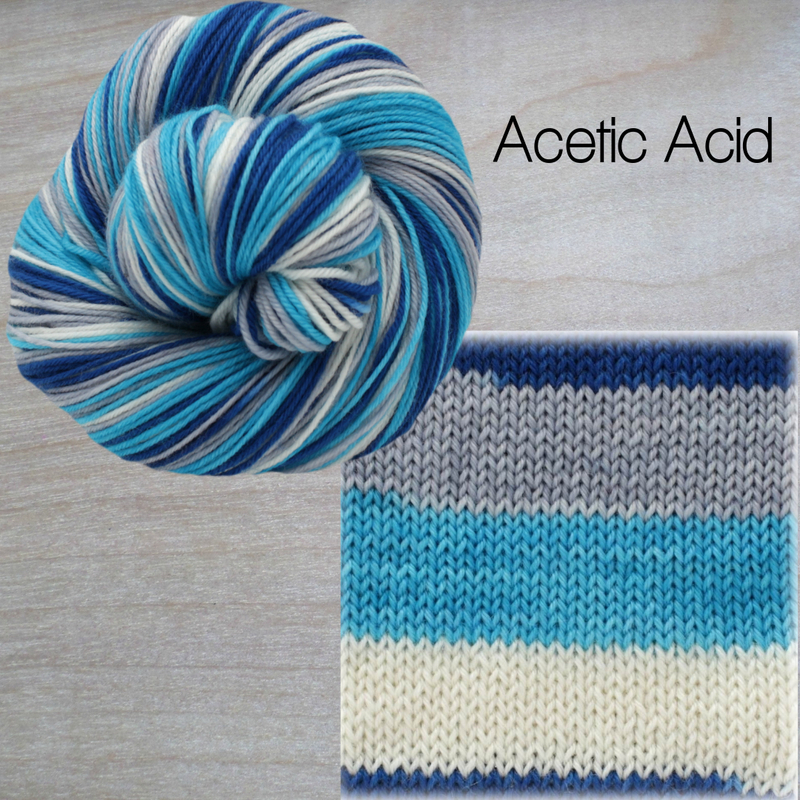 The first new color this week is Acetic Acid. It's got 10 rows each royal blue, pale steel, frozen, and white. Acetic acid, systematically named ethanoic acid, is a colourless liquid organic compound with the chemical formula CH3COOH (also written as CH3CO2H or C2H4O2). When undiluted, it is sometimes called glacial acetic acid. Vinegar is no less than 4% acetic acid by volume, making acetic acid the main component of vinegar apart from water. Acetic acid has a distinctive sour taste and pungent smell. In addition to household vinegar, it is mainly produced as a precursor to polyvinyl acetate and cellulose acetate. It is classified as a weak acid since it only partially dissociates in solution, but concentrated acetic acid is corrosive and can attack the skin. You can find sock sets with the frozen color for heels here. 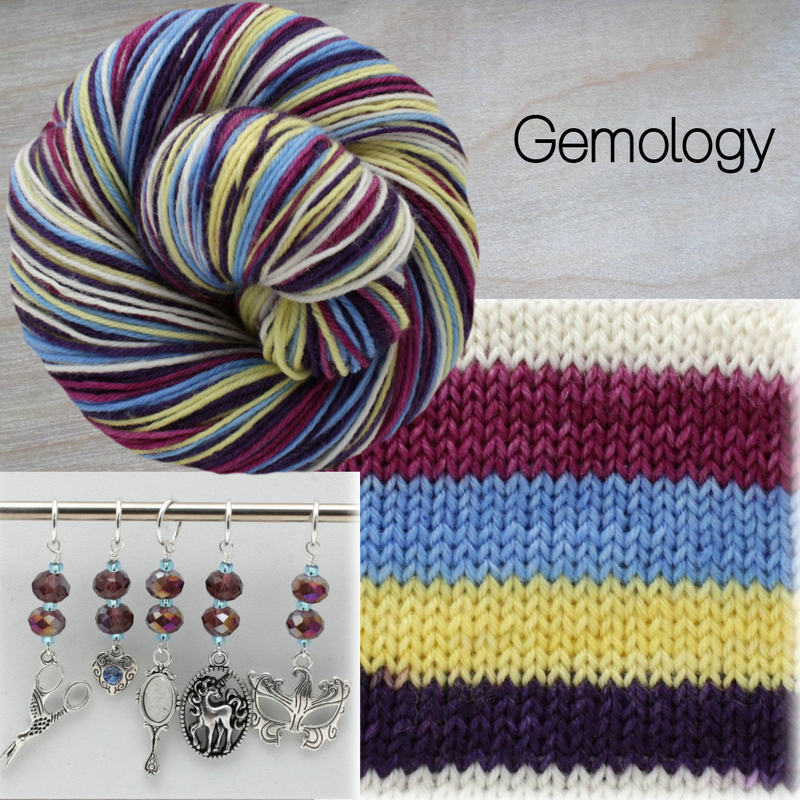 The final color in the Mane 6, Gemology is a fashion forward pony with a generous heart. She's got 6 rows each byzantium, pale blue, pale yellow, dark purple and white. Like the other ponies from this series, there is an optional, limited edition stitch marker set that goes with it. If you're curious about the color inspiration for this set, check out this image. You can find sock sets with the dark purple here. 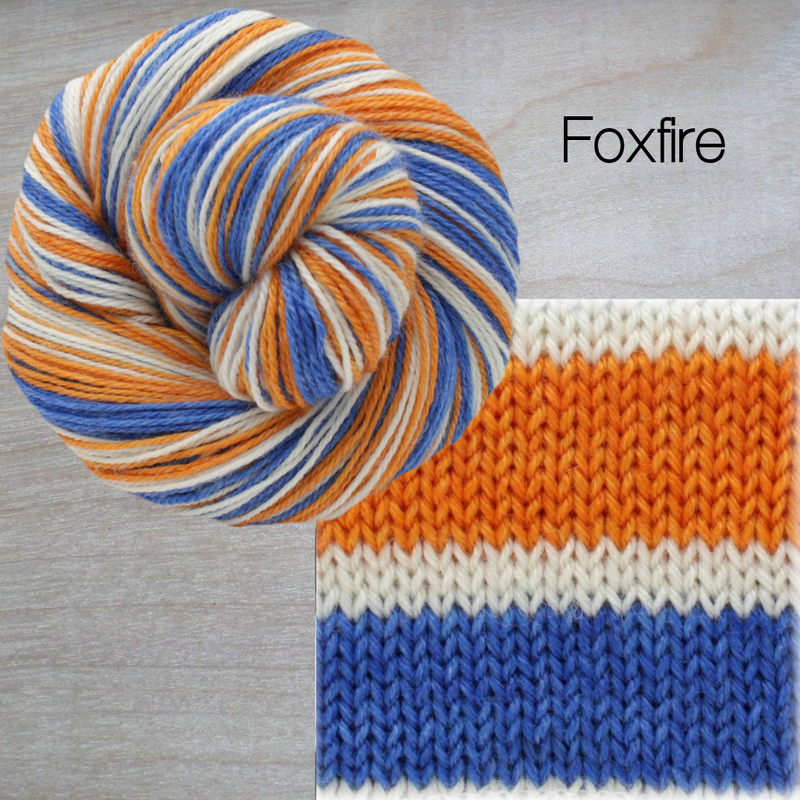 The next color for this week is Foxfire. This one is a complex stripe, with 6-7 rows orange, 3 rows white, 6-7 rows blue, 3 rows white. Foxfire, also sometimes called fairy fire or chimpanzee fire, is the bioluminescence created by some species of fungi present in decaying wood. The bluish-green glow is attributed to a luciferase, an oxidative enzyme, which emits light as it reacts with a luciferin. The phenomenon has been known since ancient times, with its source determined in 1823. You can see projects on Ravelry in this color here. 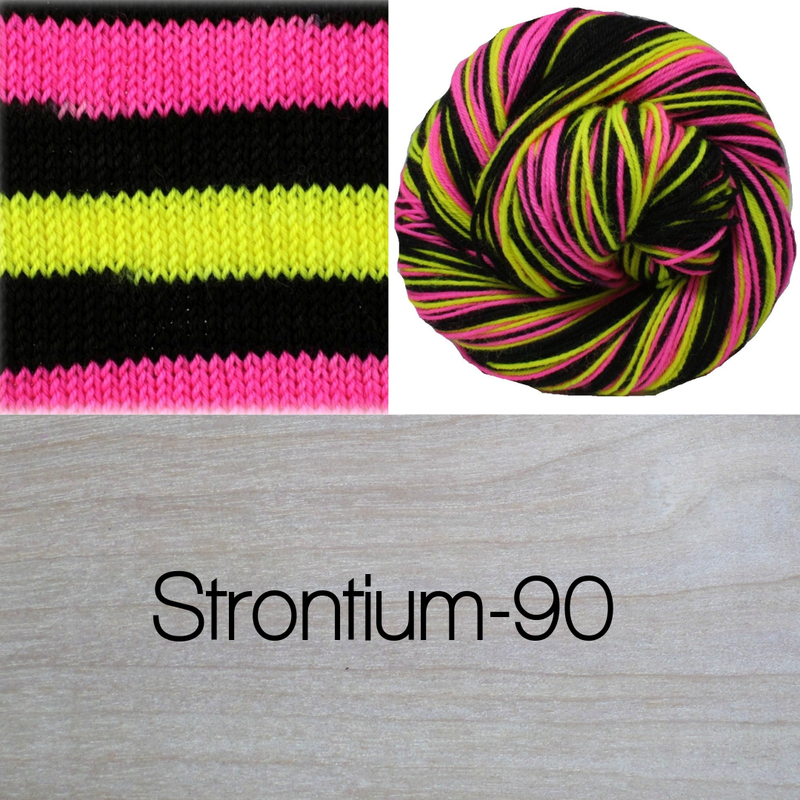 Strontium-90 is an even stripe with 7 rows black, 7 rows fluorescent yellow, 7 rows black, and 7 rows fuchsia. Strontium-90 is a radioactive isotope of strontium produced by nuclear fission, with a half-life of 28.8 years. It undergoes β− decay into yttrium-90, with a decay energy of 0.546 MeV. Strontium-90 has applications in medicine and industry and is an isotope of concern in fallout from nuclear weapons and nuclear accidents. 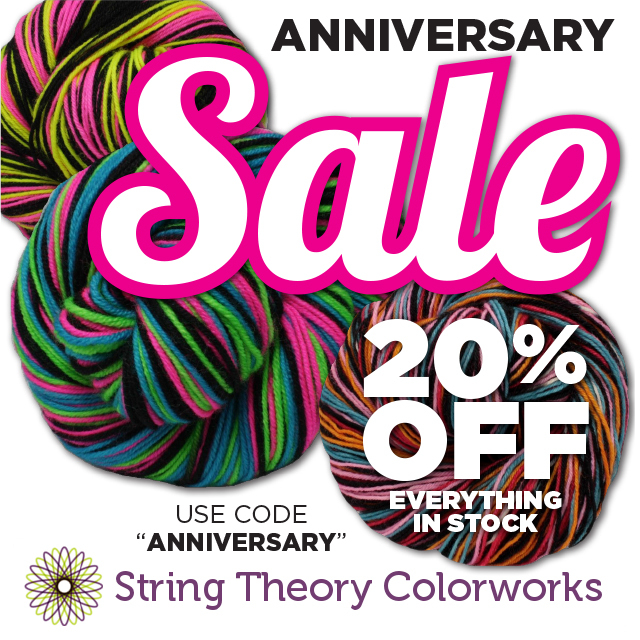 You can see projects in this color on Rav here. 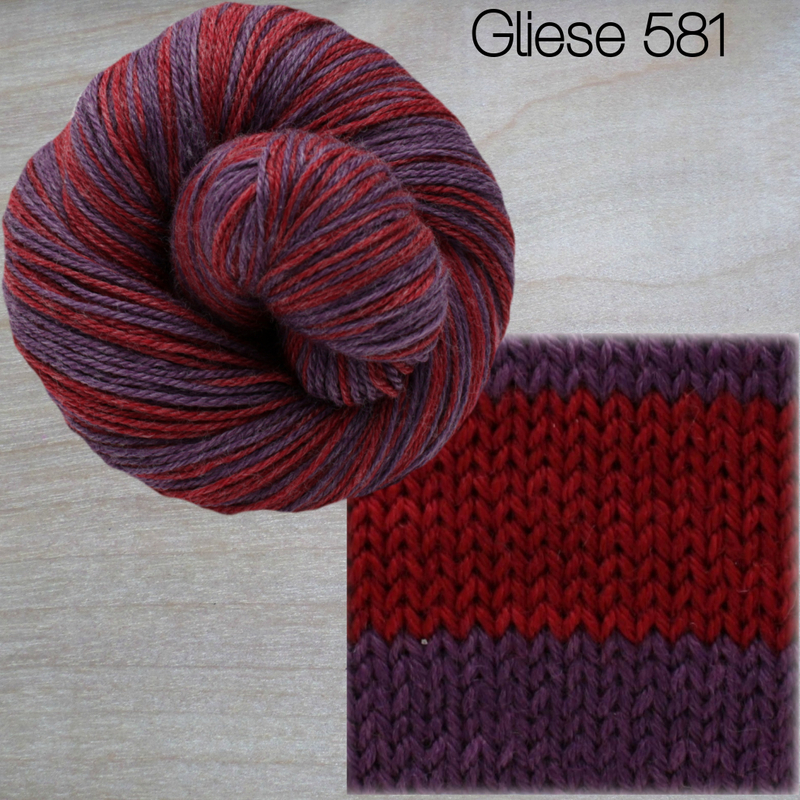 A 10 row stripe, Gliese 581 has purple and dark vermillion. Gliese 581 is a star of spectral type M3V (a red dwarf) at the center of the Gliese 581 planetary system, about 20 light years away from Earth in the Libra constellation. Its estimated mass is about a third of that of the Sun, and it is the 89th closest known star to the Sun. You can see some lovely projects in this color here. 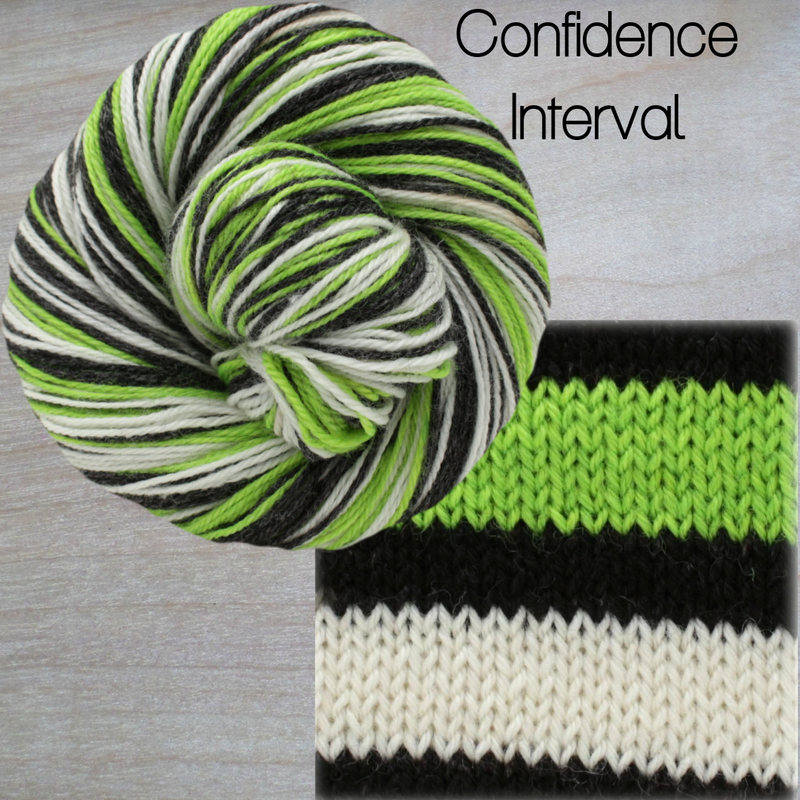 Confidence Interval is the last color for this update. It's another complex stripe, with 6-7 rows radioactive, 3 rows black, 6-7 rows white, and 3 rows black. You can find Confidence Interval here.